Spotlight on Service: Branch Manager Peter W.
Spotlight on Service: Senior Customer Assistance Representative Mary C.
Spotlight on Service is a recurring feature in which employees share how they create positive customer interactions. In this segment, we spoke to Branch Manager Peter W. who manages an Enterprise branch in Boise, Idaho. 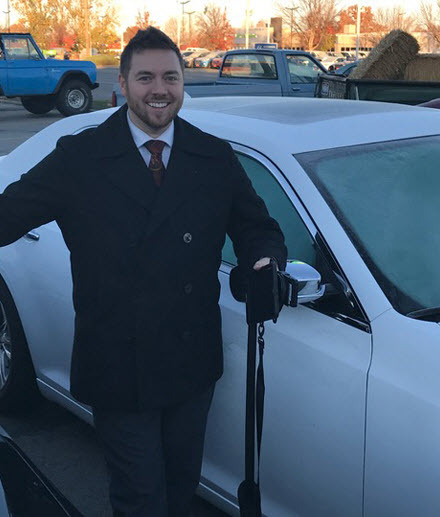 A customer wrote an email to Enterprise to express her appreciation for Peter, who went above and beyond the call of duty during a recent rental experience. Tell us about the customer and her situation. A customer called in and immediately asked about our pick-up service – she was familiar with our slogan, “We’ll pick you up.” The customer was a medevac pilot working in eastern Oregon, but living in Boise, Idaho. Her car broke down in Oregon leaving her stranded, frantic and without any rental options from the small town she worked in. She previously rented from our branch and had our phone number saved on her cell phone. When she called and explained her situation, I knew I couldn’t leave any stone unturned. I drove two and a half hours from Boise to La Grande to pick the customer up and then processed her rental paperwork. She kept saying over and over how much this meant to her. To me, it was just doing the right thing and providing great customer service. As it turns out, the customer’s previous job was flying aircraft fighting fires. Prior to my Enterprise career, that’s what I did. We had a great conversation and shared stories during the drive. Were you surprised this customer wrote a note of appreciation? I wasn’t expecting any sort of recognition. For someone to write such heartfelt and kind words – it really means a lot. There are good people out there who compel me to go the extra mile every day. What’s your secret to providing great customer service? No customer should leave the branch without smiling. There is nothing we can’t handle or figure out. Every day I challenge the team to put themselves in the customer’s shoes. We have a great group and as a team, we are committed to going above and beyond every day. Tell us about your career at Enterprise. I have been with the company for five years. I started in downtown Boise and then moved to the Boise airport location. I made a few other stops before landing at my current branch as Branch Manager. I’m proud to be a part of the Enterprise family and grow my career with a great company.